Sterling Sheffield (6) of the University of Maine is all smiles as he returns to the sideline during Saturday's Colonial Athletic Association game at Towson University. The Black Bears edged the Tigers 28-21 in a battle of nationally-ranked Football Championship Subdivision squads. TOWSON, Md. 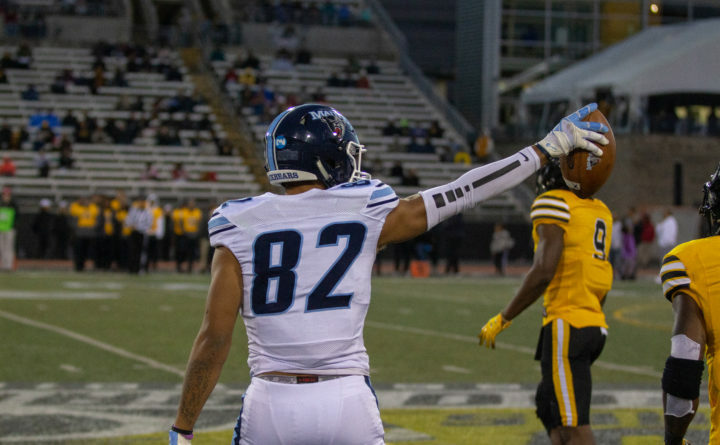 — Jamehl Wiley and Sterling Sheffield stopped running back Shane Simpson on a fourth-and-goal play from the 4-yard line with 1:21 remaining on Saturday, helping the University of Maine football team hold on for a 35-28 Colonial Athletic Association victory over Towson University at Johnny Unitas Stadium. Coach Joe Harasymiak’s 23rd-ranked Black Bears (6-3) improved to 5-1 in conference play and retain a share of the CAA lead along with Delaware (7-2, 5-1 CAA). The No. 15 Tigers slipped to 6-3 and 4-2, respectively. UMaine demonstrated its resilience and prevailed despite squandering an 18-point third-quarter lead. “I’m very proud of the guys to come on the road and get a big-time win, something we’ve been struggling with, especially in November,” Harasymiak said, referring to last season. Ramon Jefferson rushed for a career-best 130 yards on 14 carries, including scoring runs of 62, 2 and 6 yards. Chris Ferguson passed for 233 yards and two touchdowns on 16-for-32 accuracy and was intercepted once. Earnest Edwards led the receiving corps with three catches for 74 yards, including scoring grabs of 7 and 46 yards. The Black Bears outgained the Tigers 408-367 but had difficulty containing Towson quarterback Tom Flacco. The elusive brother of Baltimore Ravens QB Joe Flacco completed 21 of 36 passes for 211 yards with two touchdowns and two interceptions. He also rushed for 67 yards on 19 attempts. “Our defense has been our backbone all year. Today they got challenged by the best offense we’ve ever gone against and the best player we’ve seen all year,” Harasymiak said. Simpson (64 yds.) and Shane Leatherbury (63 yds.) each made six catches for the hosts. UMaine had regained the lead with 6:22 left when Jefferson closed out a nine-play, 85-yard march with a 6-yard touchdown run that featured plenty of help from anyone who could keep the pile moving toward the end zone. The Black Bears converted five second-down plays on the drive, which included a 21-yard hookup from Ferguson to Edwards and a 16-yard pass from Ferguson to Devin Young. The Black Bears defense stood tall in the closing minutes as the Tigers threatened to either pull even or potentially go ahead. Towson moved from its own 36 to the UM 2-yard line. On second-and-goal, Simpson was stopped for no gain by Deshawn Stevens and Andrew Stevens tackled Yeedee Thaenrat for a 2-yard loss on the next play. After three timeouts, including two by Towson, the hosts lined up and tried a fake reverse. 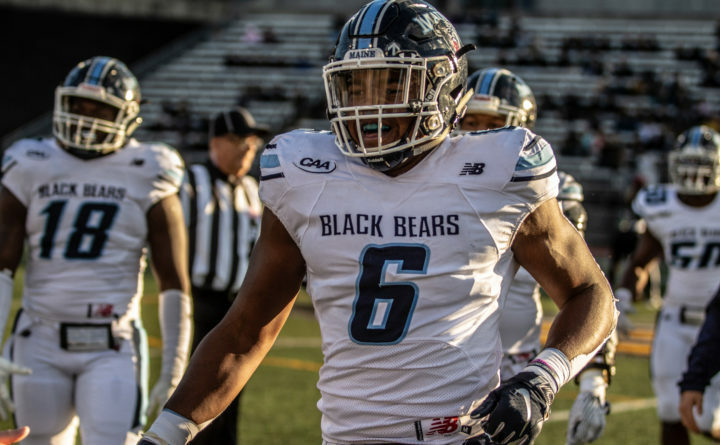 Wiley and Sheffield were among the Black Bears who did not bite and dropped Simpson two yards shy of the goal line with 1:21 to play. “Jamehl did a great job getting penetration and I was able to help finish him off,” Sheffield said. Backed up against its own goal line, UMaine ran two quarterback sneaks to run out the clock. Jeff DeVaughn led the defense with nine tackles, while Sheffield (interception) and Taji Lowe posted six each. Kayon Whitaker made five stops, including two of UMaine’s four sacks. Robert Hayward paced Towson with six tackles and Bryce Carter posted five tackles, three of them for a loss of yardage, with a sack and a forced fumble. UMaine opened the scoring on a 7-yard TD pass from Ferguson to Edwards that closed out a 74-yard drive and made it 14-0 when Edwards scored on a 46-yard toss from Ferguson on the first play of the second quarter. Towson countered only two plays later on a 14-yard pass from Flacco to Jabari Allen that was set up by Coby Tippett’s 48-yard kickoff return to the UM 36. The Black Bears finally restored a two-score advantage late in the half as Jefferson bolted 64 yards and Kenny Doak added the PAT for a 21-7 halftime lead. The Tigers got within 11 on Aidan O’Neill’s 36-yard field goal early in the third quarter, but UMaine countered with a 2-yard Jefferson TD run to make it a three-score game at 28-10. Towson was equal to the task and rattled off three straight scores — Flacco’s 26-yard scoring toss to Simpson, a 38-yard O’Neill field goal and a 10-play, 66-yard march that culminated in Simpson’s 5-yard TD scamper to tie it with 10:14 remaining. UMaine led 28-10 midway through the third quarter, but the Tigers came roaring back with 18 unanswered points. Towson knotted things up with 10:09 to play when Simpson capped a 10-play, 66-yard drive with a 5-yard scoring run.